An arrhythmia is an abnormal heart rhythm. Not allowing the lower chambers (ventricles) to fill with enough blood, because an abnormal electrical signal is causing your heart to pump too fast or too slow. Not allowing enough blood to be pumped out to your body, because an abnormal electrical signal is causing your heart to pump too slowly or too irregularly. Not allowing the top chambers (atria) to work properly. An arrhythmia can occur in the sinus node, the atria, or the atrioventricular node. These are supraventricular arrhythmias. A ventricular arrhythmia is caused by an abnormal electrical focus within your ventricles. This results in abnormal conduction of electrical signals within your ventricles. Arrhythmias can also be classified as slow (bradyarrhythmia) or fast (tachyarrhythmia). "Brady-" means slow, while "tachy-" means fast. In any of these situations, your body's vital organs may not get enough blood to meet their needs. 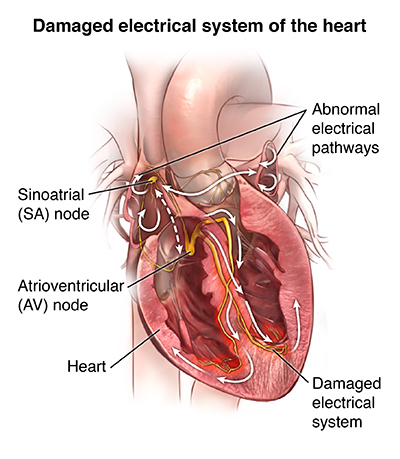 An arrhythmia occurs when there is a problem with the electrical system that is supposed to regulate a steady heartbeat. With an impaired electrical system, your heart may beat too fast, too slow, or irregularly. What are the risk factors for an arrhythmia? 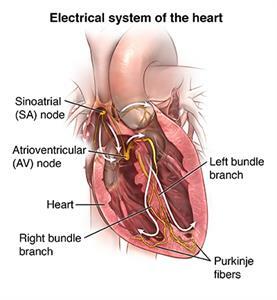 Many risk factors can affect the electrical system of your heart and, therefore, cause an arrhythmia. Substances including caffeine, alcohol, tobacco, illegal drugs, diet drugs, some herbs, and even prescription medicines can trigger an arrhythmia. Health conditions including coronary heart disease, high blood pressure, and diabetes contribute to developing arrhythmias. Arrhythmias become more common with age. What are the symptoms of arrhythmias? The symptoms of arrhythmias may look like other conditions. Always see your healthcare provider for a diagnosis. Electrocardiogram (ECG). An electrocardiogram is a measurement of the electrical activity of your heart. By placing electrodes at specific locations on your body (chest, arms, and legs), a graphic representation, or tracing, of the electrical activity can be made as the electrical activity is received and interpreted by an ECG machine. An ECG can show the presence of arrhythmias, damage to your heart caused by ischemia (lack of oxygen to the heart muscle), or myocardial infarction (MI, or heart attack), a problem with one or more of the heart valves, or other types of heart conditions. Resting ECG. For this procedure, the clothing on your upper body is removed and small sticky patches called electrodes are attached to your chest, arms, and legs. These electrodes are connected to the ECG machine by wires. The ECG machine is then started and records your heart's electrical activity for a minute or so. You are lying down during this ECG. Exercise ECG, or stress test. You are attached to the ECG machine as described above. However, rather than lying down, you exercise by walking on a treadmill or pedaling a stationary bike while the ECG is recorded. This test is done to assess changes in the ECG during stress, such as exercise. Signal-averaged ECG. This procedure is done in the same manner as a resting ECG, except that your heart's electrical activity is recorded over a longer period of time, usually 15 to 20 minutes. Signal-averaged ECGs are done when arrhythmia is suspected, but not seen on a resting ECG. The signal-averaged ECG has increased sensitivity to abnormal ventricular activity called "late potentials." 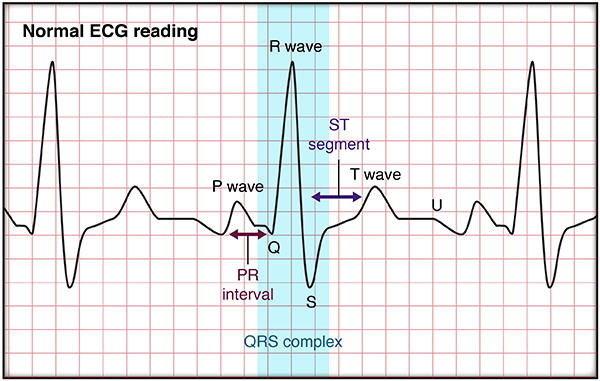 Signal-averaged ECG is used in research and seldom used in clinical practice. Electrophysiologic studies (EPS). A nonsurgical but invasive test in which a small, thin tube (catheter) is inserted into a large blood vessel in your leg or arm and advanced to your heart. This lets your doctor find the site of the arrhythmia's origin within your heart tissue. Your doctor is then able to determine how to best treat it. Sometimes, your doctor can treat the arrhythmia by doing an ablation at the time of the study. Holter monitor. A continuous ECG recording done over a period of 24 or more hours. Electrodes are attached to your chest and connected to a small portable ECG recorder by lead wires. Holter monitoring may be done when an arrhythmia is suspected, but not seen on a resting ECG. Arrhythmias may be transient in nature and not seen during the shorter recording times of the resting ECG. You go about your daily activities, except those that cause an excessive amount of sweating. This could cause the electrodes to become loose or fall off during the procedure. These activities include taking a shower or swimming. Event monitor. This is similar to a Holter monitor, except that you start the ECG recording only when you feel symptoms. Event monitors are typically worn longer than Holter monitors. You can remove the monitor to shower or bathe. Mobile cardiac monitoring. This is similar to both a Holter and event monitor. The ECG is monitored constantly to allow for detection of arrhythmias, which are recorded and sent to your doctor regardless of whether you have symptoms. You can also start recordings yourself when you have symptoms. These monitors can be worn up to 30 days. Implantable loop recorder. This is a miniature heart recording device that is implanted underneath the skin overlying your heart. It can record the heart rhythm for up to 2 years and it useful in diagnosing intermittent or rarely occurring arrhythmias. Some arrhythmias may cause few, if any, problems. In this case, you may not need treatment. When the arrhythmia causes symptoms, you have several different choices for treatment. Your healthcare provider will choose a treatment based on the type of arrhythmia you have, how severe your symptoms are, and whether you have other conditions such as diabetes, kidney failure, or heart failure. These can affect the course of the treatment. Lifestyle changes. Stress, caffeine, and alcohol can cause arrhythmias. Your healthcare provider may recommend that you avoid caffeine, alcohol, or any other things that may be causing the problem. If your provider thinks that stress is a cause, he or she may recommend meditation, stress-management classes, an exercise program, or psychotherapy to ease stress. Medicine. Medicine is available to treat arrhythmias. Your healthcare provider will recommend a medicine based on to the type of arrhythmia you have, whether you have other health conditions, or whether you take other medicines. Cardioversion. In this procedure, the healthcare provider sends an electrical shock to your heart through the chest. This will stop certain very fast arrhythmias such as atrial fibrillation, supraventricular tachycardia, or atrial flutter. You are connected to an ECG monitor, which is also connected to the defibrillator. 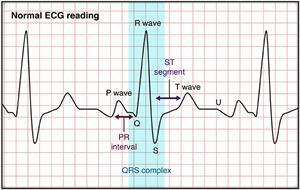 The electrical shock is delivered at the point during the ECG cycle to change the rhythm to a normal one. Ablation. This is an invasive but nonsurgical procedure done in the electrophysiology lab. The healthcare provider puts a thin, flexible tube (catheter) into your heart through a vessel in your groin or arm. The provider uses a method such as radio frequency ablation to destroy the site of the arrhythmia. The procedure uses very high frequency radio waves to heat the tissue until the site is destroyed. Cryoablation is another procedure that is used. For this an ultra-cold substance is put on the site. This freezes the tissue and destroys the site. Pacemaker. A permanent pacemaker is a small device that is put under the skin, often in the chest region just under the collarbone. It sends electrical signals to start or regulate a slow heartbeat. A permanent pacemaker may be used to make the heart beat if the heart's natural pacemaker (the SA node) is not working as it should, or if the electrical pathways are blocked. Pacemakers are often used for slow arrhythmias such as sinus bradycardia, sick sinus syndrome, or heart block. Implantable cardioverter defibrillator (ICD). An ICD is a small device similar to a pacemaker. It is put under the skin, often just under the collarbone. An ICD senses the rate of the heartbeat. When your heart rate goes higher than the level entered into the device, it sends an electrical shock to the heart. This corrects the rhythm to a slower, more normal heart rhythm. ICDs are used with a pacemaker to send an electrical signal to regulate a slow heart rate. ICDs are used for life-threatening fast arrhythmias such as ventricular tachycardia or ventricular fibrillation. Surgery. Surgery is usually done only when all other treatments have failed. Surgical ablation is a major surgery that needs general anesthesia. The surgeon opens your chest to reach your heart. The surgeon destroys or removes the tissue causing the arrhythmia. What are the complications of an arrhythmia? Some arrhythmias have no complications. However, arrhythmias that are more serious can result in heart failure, stroke, or even cardiac arrest. Living with an arrhythmia includes making lifestyle changes (avoiding caffeine, alcohol, or other triggers) and taking medicines as directed. It may also include having a pacemaker or implantable cardioverter defibrillator inserted. If you have a pacemaker or implantable cardioverter defibrillator, make sure that you ask your healthcare providers about any restrictions or lifestyle changes you may need to make. Working with your provider can promote your health and well-being. An arrhythmia can occur in the sinus node, the atria, or the atrioventricular node, or the ventricle. Some arrhythmias cause few, if any, problems. Other arrhythmias can cause serious complications such as heart failure, stroke, or even cardiac arrest. Many treatment options are available to treat arrhythmia, including medicines, devices, cardiac ablation, and surgery. Many arrhythmias can be cured with procedures.